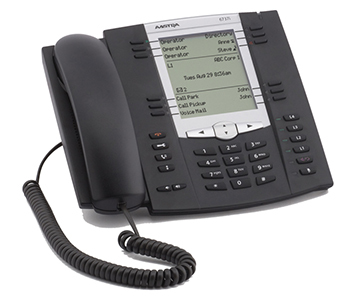 The Aastra 6755i offers powerful features and flexibility in a standards based, carrier-grade advanced level expandable IP telephone. With a sleek and elegant design, 144 x 75 pixel backlit LCD display and 6 dynamic context-sensitive softkeys, the 6755i is fully interoperable with leading IP Telephony platforms, offering advanced XML capability to access custom applications and support for up to 9 calls simultaneously. The 6755i is ideally suited for moderate to heavy telephone users who require more one touch feature keys and XML based programs. The Aastra 6755i is equipped with XML browser capabilities and a large display with dynamic softkeys to easily access customized services and applications. This allows creation of internal service applications using development guides available from Aastra. This feature provides unlimited potential to customize the 6755i to meet your specific business needs or vertical applications using the display and keypad. With extensive storage capacity for personal directories, callers logs, redial lists and 12 programmable keys, the Aastra 6755i can improve efficiency by providing more call information with the push of a button. This includes features such as shared call and bridged line appearances, call forward, call transfer, call waiting, intercom and 3-way conference providing enhanced call flexibility and control. The Aastra 6755i offers two different module extension options. It supports up to three Aastra M670i modules, each offering 36 keys with LED indicators to create a feature rich attendant console. Or, it will also support up to three of the advanced Aastra M675i modules, each offering 60 keys with a screen based LCD display and LED system. A1755-0131-10-01 – NA power adapter included. English Kpad. A1755-0131-10-55 – Univ power adapter included. Symbol Kpad. Download the YipTel Aastra 6755i Datasheet (PDF).